People are fascinated by acting. 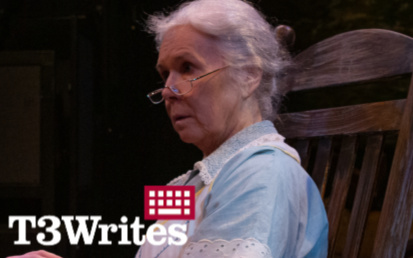 Audiences often wonder how actors learn lines or get into character or walk around a stage in a garment or with the mannerisms of a time that the actor did not live through. Well, it’s Halloween and this seems like the perfect time and play to talk about being something that you are not. We all started acting at roughly the age of two, we just didn’t call it that. We said “play” or “dress up”. I’ve watched my brother’s kids act like animals or monsters or aliens. They don’t ask if they can relate to a shark. They just say, “I’m a shark,” and then they are a shark. In addition to the declaration, they will give a physical indication that they are a shark like a hand-fin (in case it’s not clear by the completely un-shark-like snarls, the gnashing of teeth, or splashing of water), and the other kids accept it and react according to the circumstances of the world that they have created. This world in which their sibling is a shark. At its root, this is acting. It’s a little more complicated than that, but this is a blog not a book. I caught up with Felicia Bertch and Thomas Ward, who happen to be playing animals in The Moors, to write me a little something about their process as well as the style of this particular show. You can read their full statements at the bottom of this post. And you should. Because both are excellent.